(Trent Nelson | The Salt Lake Tribune) BYU's 16-10 loss to UMass last season at LaVell Edwards Stadium marked the low point of the dismal 4-9 season for the Cougars. Foxborough, Mass. • Fullback Brayden El-Bakri kept staring at the scoreboard high above LaVell Edwards Stadium, wondering when BYU’s offense was going to bust out like it had the previous week against UNLV and bury the visiting Minutemen of the University of Massachusetts. It never happened, and the Cougars were handed perhaps their most embarrassing home loss, a 16-10 disaster, in a half-century. It was the lowest point in an eventual 4-9 season filled with lows. Many believe the abysmal offensive performance led to offensive coordinator Ty Detmer losing his job. Saturday morning, about 2,100 miles from the site of that 16-10 loss, the Cougars (4-5) will get their long-awaited rematch with the Minutemen (4-6) at the NFL stadium that former Cougar defensive star Kyle Van Noy and legendary New England Patriots quarterback Tom Brady call home. BYU and UMass will meet for the third time (BYU won the first meeting, 51-9) at 10 a.m. MST at Gillette Stadium. Revenge and redemption are the obvious pregame storylines, but BYU coach Kalani Sitake and his players have generally dismissed those factors this week. The more pressing matter is bouncing back after two close losses — 7-6 to Northern Illinois and 21-16 to Boise State — and getting a step closer to bowl eligibility. Another loss would likely crush those postseason dreams, seeing as how the Cougars finish the season at Utah, where they haven’t won since 2006. Because the game is being played in the Eastern Time Zone with a noon local time kickoff, the Cougars flew to Boston on Thursday afternoon after practicing in Provo that morning. They saw the stadium for the first time Friday. A cold, partly-cloudy day is expected at the stadium 30 miles southwest of Boston, with temperatures in the low 40s. “Offensively, our guys need to be clicking and just finish drives when they get in the red zone, score touchdowns and not kick a lot of field goals, and I think we will be OK,” Sitake said. Last year, UMass quarterback Andrew Ford was 21 of 35 for 230 yards and threw a 40-yard touchdown pass to Andy Isabella. However, He’s been replaced by Ross Comis, who is also a capable passer but looks to run more. 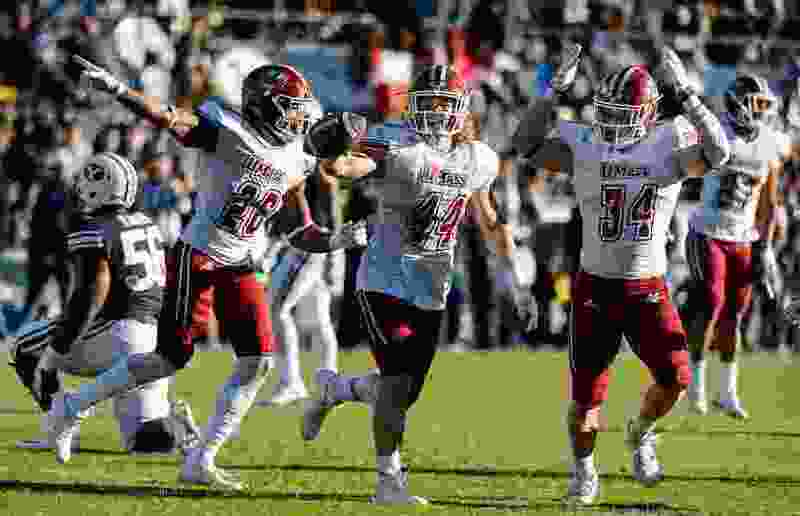 Isabella is not only back, he leads the NCAA in receiving yards (1,394) and posted a school-record 303 receiving yards in UMass’ triple-overtime win over Liberty last week. The Cougars are 6-4 in their last 10 games played in an NFL stadium, but haven’t played in one since losing to LSU at the Superdome in New Orleans in 2017. And perhaps erase some awful memories of last year’s game in Provo. At Gillette Stadium, Foxborough, Mass. About the Minutemen • Senior receiver Andy Isabella reset the school record with 303 receiving yards in the 62-59 triple-overtime win over Liberty last week and is the leading receiver in the country with 1,394 yards. … They will host BYU next season at their on-campus stadium in Amherst, Mass. … LB Bryton Barr is third in the country in total tackles with 123. About the Cougars • They are 6-4 in their last 10 games played in NFL stadiums. … This is their longest trip of the season, covering around 4,200 miles round trip. They will have traveled 10,000 miles by season’s end, after traveling 17,000 miles last year when Hawaii was on the schedule. … They are 26th in the country in total defense, allowing just 334.1 points per game. They are 118th in the country in total offense, gaining an average of 333.1 yards per game.